Virus is a danger for a user who likes to surf the web, searching anything helpful or interesting. I can say for sure that there is no user that did not have a virus on his computer. There are a lot of types of viruses and at least one of them existed on a computer, even if the computer was not connected to the internet. It could be infected with the help of a flash drive or other removable media. If the behavior of you PC seems strange to you, then it is high time to find good virus removal software or manual removal instructions that really help. Read this article in order to solve viral problems on your computer. If cannot tell for sure that your Pc is infected with viruses, then you are welcome to read the article from this website that will help you to detect whether your computer is infected, it will help you to recognize all the signs of the possible infections. If you are sure that all the strange things that happen are the symptoms of viruses, then you should begin to perform the instructions from this page. Start rebooting your computer and when it will begin to load (it will happen before you will see the Windows logo), you should press F8 repeatedly. The experienced users can find the very moment in order to press F8 just one time to boot the PC into the Safe Mode, but if you are not sure that you will catch this moment, just press it repeatedly. Then you should select Safe Mode with Networking in the menu and press Enter. If you will do everything rightly, then you will see your desktop but on the black background. Do not worry, your favorite background photo will return when you will reboot your computer into Normal Mode (just rebooting your PC), but you should not do it right now, you should perform some instructions before it. Then try to use internet connection (use Internet Explorer) to download virus removal software and use it. Click Start button, type run in the search field and click it when it will be found. Then restart the Internet Explorer and repeat the attempt to download any virus removal tool or antivirus program. Clean Temporary Internet Files for that you should type Temporary in the search field of the Start menu and select Delete cookies or temporary files. Put the tick in the checkbox that is called Delete browsing history on exit, then press OK.
Open Task Manager, pressing CTRL+SHIFT+ESC. Find the processes the names of which are consist of the random characters with numbers if there are any, you should highlight them one by one and click End process. You will see the Restore system files and settings window. You should click Next here. Select the Restore point, then click Next. Click Finish on the Confirm your restore point. Click Yes to the dialog box “Do you want to continue”. If these instructions were not helpful, then you should try to select another restore point if there is any. 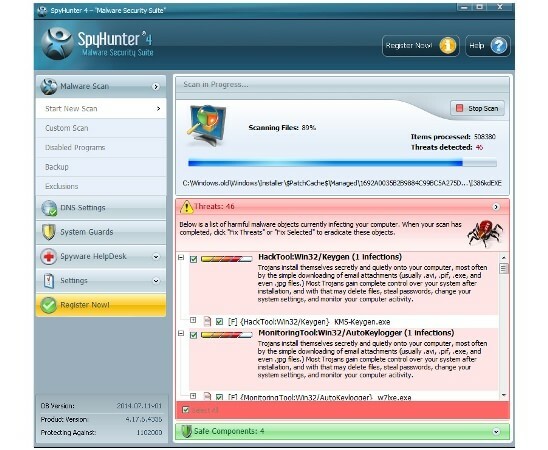 It is advised to scan your computer for viruses after the system restoration, because some viruses can appear again after some time. You can use special virus removal tool from this page. The download link can be found above. You should also protect your computer, installing any antivirus program (if you do not have it) or reinstalling it (if it was installed when you had a virus that corrupted it) for the best virus removal in the future.